Vivus Architecture + Design » Archive » Why’d they do that? We came across this condition in an historic house we are remodeling. The wall is balloon framed, then sheathed on the outside. That’s the sheathing in the background. The face of a stud is marked with an ‘X’; wood lath and finish plaster used to be in that plane. The plaster you see is about in the middle of the stud. This was achieved by adding a nailer on both sides of the cavity, attaching wood lath, then plastering. The process would have been a tremendous amount of labor. Why did they do that? Perhaps someone out there knows the exact reason, but we can only speculate. It could have been to provide insulative value, or it could have been to add shear strength to the wall. Perhaps this was a noisy neighborhood, so they tried to shut out sound. Maybe it was a way to train apprentices without having the product visible upon completion! I believe this is what the old timers I’ve worked with call ‘back plastering’. 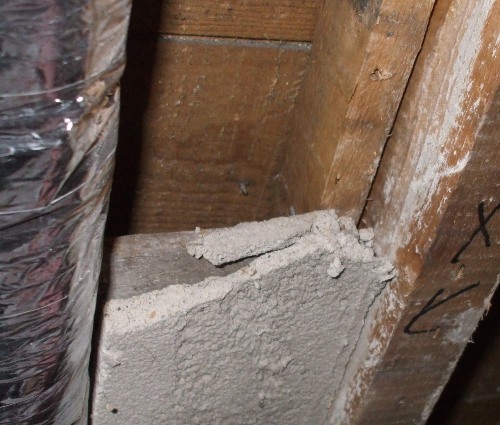 It was very common in homes constructed in the late 1880’s through 1930 or so…before other insulation materials became commonly available. If I understand it properly, the purpose was to cut down on the wind blowing into the stud wall cavity. You usually find it in houses that have clapboard siding. The siding could warp and twist, making it easier for wind to enter the stud wall cavities and end up creating real cold spots in the homes. In my construciton work I’ve found back platering was very common in rural houses…not as common in cities. I assume this was because the rural homes were often more exposed to the elements. I rarely find back plaster used on homes with stucco exteriors. I think this is due to the fact that stucco resists wind penetration much better than clapboards. Back plastering seemed to end about the time flax linen insulation started to be used. Flax insulation seemed to accomplish the goal of cutting down wind penetration since it was so dense, and it provided some incremental level of actual insulation.